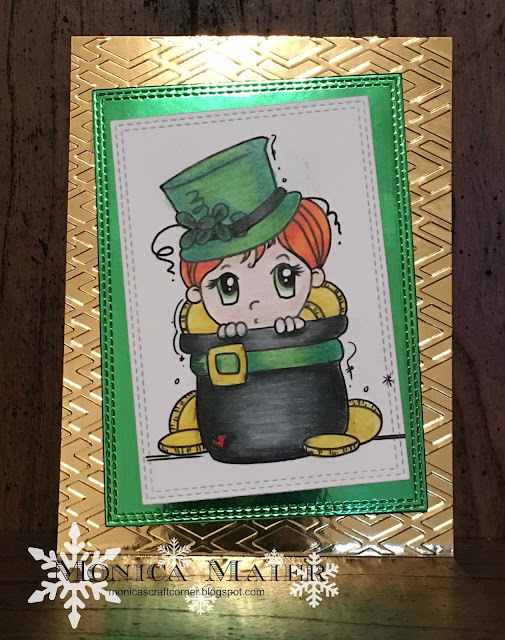 Monica's Craft Corner: Pot of gold.. Here is my first card for the Die Cut Diva's and our Something Spring challenge. Our wonderful sponsors this month are fabulous DiesRUs and Bugaboo stamps. For more on the prizes and to link up for to the challenge see our main post here. I started my card by coloring my digi image with colored pencils, before die cutting the panel. Then I die cut an accent panel out of metallic green cardstock. Before putting the card together I decided to emboss one more panel out of a metallic gold cardstock and then adhered all the layers together. I hope you play along with out something spring challenge, can't wait to see what everyone has to share with us! Thanks for stopping by and have a great day! I love those MFT dies, and that beautiful image!